Let's get to the juicy details first. Kevin Feige revealed to SFX Magazine that the core foundation of The Avengers will be a unit of three. He did however add a very exciting treat. He said, "It's three people - four including the Hulk; five including Nick Fury - who you've seen before in other movies, coming together for the very first time." 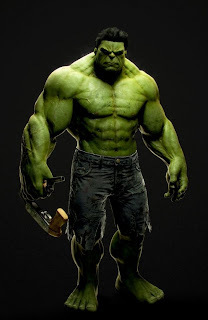 Yes, Kevin Feige confirms that the Incredible Hulk will be apart of "The Avengers," something fanboys have been longing for. Marvel has been very careful working towards their team-up film. They wanted to make very certain that the core members of The Avengers are characters we already know and have seen their particular backstories. Feige explained this idea by saying, "My only concern is that when we launch a franchise--whichever character's franchise that may be--it should stand on its own two feet... So by the time 'The Avengers' comes in 2012, it's not just a team superhero movie with a bunch of characters with powers." To further reiterate Marvel's logic of defining new characters before the team-up film, Kevin Feige pointed to "Iron Man 2." He said, "It's fun now, and we're introducing some new characters in 'Iron Man 2,' but it's not about just cramming in lots of new people; that's sort of the cardinal sin of the sequel - adding in too many characters. This is totally Tony Stark's story." Feige also pointed to the fact that the core story setup in the Iron Man films will be further intertwined into both the "Thor" and "First Avenger: Captain America" films. He said, "That's gonna weave into Thor's story, and Steve Rogers' story, and it's already ingrained with Nick Fury's story and an organization known as S.H.I.E.L.D." Talking about "Thor" specifically, a lot of folks have wondered how Marvel intends to tie-in a fantasy world into the tech-based reality created in the Iron Man movies. Kevin Feige answered that question directly. He pointed to the fact that Marvel Studios will stay in the Marvel Universe and not the Norse mythology of old. He said, "In the 'Thor' of the Marvel Universe, there's a race called the Asgardians. And we're linked through this Tree of Life that we're unaware of. It's real science, but we don't know about it yet. The 'Thor' movie is about teaching people that." Last but certainly not least, Kevin Feige eluded to what other Marvel character could we expect coming to the big screen. First and foremost, Feige says that there is a chance for another Incredible Hulk movie with Edward Norton. He said, "That would be post-'Avengers,' if it happened... I think there's a chance. It's certainly our intention to use the same actors from film to film where we can." Kevin Feige also explained a few key Marvel heroes he'd like to see on film including a space epic!. He said, "I love Doctor Strange. Ant-Man is like Whiplash - one of those chracters where you're like, 'Really?' that we've got a fun story with. I've always wanted to do something with Black Panther. I think what Ed Brubaker and Matt Fraction have done with Iron Fist lately is great, and the Iron Fist mythology opens up a whole other part to us. I'd love to break into the cosmic side of the Marvel Universe even more- it's kind of there in 'Thor.' J.J. Abrams' 'Star Trek' got me jonesing to do that. It's what I grew up on - 'Star Trek' and 'Star Wars.' I want to do a big space epic. And we've got them in Marvel."